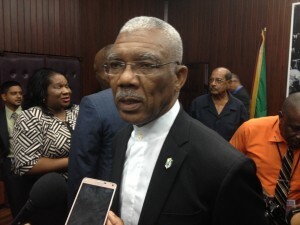 Amidst rising concerns about a possible refugee crisis in Venezuela with the country’s economy on a rapid meltdown, Guyana’s President David Granger has declared that Guyana will be willing to accept Guyanese looking to return home from the neighbouring country. Venezuela has been in crisis since the decline in oil prices on the world market. 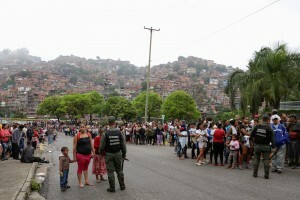 International media reports indicate that three years of recession, crime, shortages, looting, electricity and water rationing, and inflation projected to rise to as much as 700 percent, have angered Venezuelans. However, the President said that Guyana is obligated to accept any Guyanese returning from Venezuela. “I am deeply concerned, Guyana has special interest because of the territorial question, but I think the whole region is concerned about what is taking place in Venezuela, and we hope that there is not going to be a resort to lawlessness,” President Granger said. Venezuelan soldiers outside a supermarket while people lining up to buy basic food items in Caracas, Venezuela, on Sunday. More particularly, the President expressed concerns about the involvement of the Venezuelan National Armed Forces in the crisis in the country. Venezuelan President Nicolás Maduro has deployed military personnel on the streets as part of an operation to address the growing crime situation and protests. “I hope that a legal approach is taken, an orderly approach is taken for the security of the whole sub-region because it will have an impact on the Caribbean as well,” President Granger said. The Guyana Defence Force has already stated that the situation is being monitored.